One of six men wrongly convicted of the Birmingham pub bombings branded the British legal system as unable "to spell the word justice", declassified documents reveal. 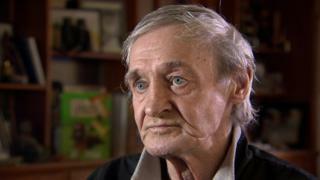 Paddy Hill also said successive Irish governments abandoned the Birmingham Six in their fight for freedom. The assessment was revealed in a handwritten letter, from his cell in HMP Gartree on 10 September 1987. The note, laden with anger, said they were offered nothing but false hope. Mr Hill's two-page letter to Senator Paschal Mooney, and forwarded on to the Department of Foreign Affairs, was released by the National Archives along with other files relating to the case under the 30-year rule. The Birmingham Six - Mr Hill, Hugh Callaghan, Gerard Hunter, Richard McIlkenny, William Power and John Walker - were wrongly jailed for life in 1975 for the IRA bombings which killed 21 people. What were the Birmingham pub bombings? Their convictions were eventually quashed in the appeal court and they were released in 1991. In the letter, Mr Hill said: "The British system don't know how to spell the word JUSTICE never mind dispensing it." He repeated the words outside the Old Bailey, on the day the men were released. At the time of the letter, Mr Hill had served 12 years in prison and had been in jail while four different Irish prime ministers took office - Liam Cosgrave, Jack Lynch, Garret FitzGerald and Charles Haughey. "The only thing successive Irish Governments have done is help to keep innocent Irishmen in prison," he wrote. He said governments had done little or nothing to support him and the five others. "The only thing they have done for us is to give us false hope and false promises." Another of the Birmingham Six, Richard McIlkenny, wrote to the government from Wormwood Scrubs on 22 August 1987. He warned an extradition treaty between the UK and Ireland was a "grave mistake" while they were still in prison. "Justice cannot be bought. If this extradition treaty is signed on December 1 then I feel strongly that we and the other innocents can say goodbye to any chances of freedom no matter how strong the evidence on our behalf," he said.